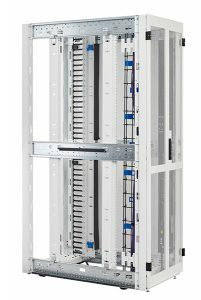 The Eaton RS Enclosure for Network Configuration includes a tool-less configuration, power-optimized design, and extensive cable and airflow management solutions to manage medium-to-high density requirements. 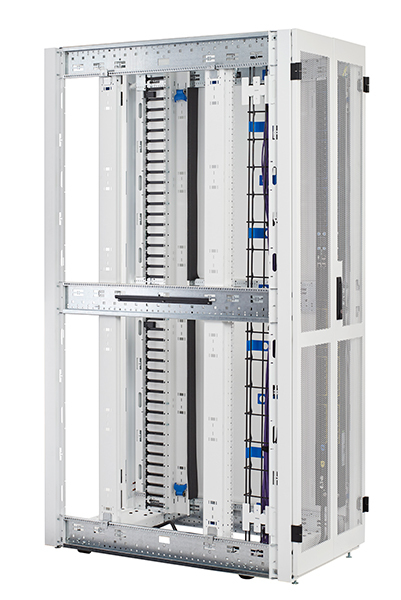 You can easily install Eaton cable fingers and Flextray without using any tools to help manage your networking cables. For managing airflow effectively, optional air dams, blanking panels and other tool-less accessories are available. Includes best-in-class features for simple installation and configuration including, leveling feet; casters; an adjustable base plate in rear for cable pass through; flush-mounted solid side panels; full-front door that features a 77% open perforation pattern with a contoured profile for maximum airflow and surface area; and 19-inch tool-less adjustable rails. Ideal for applications with medium-to-high density cabling. Cable managers are installed in the front and rear of the enclosure.